Oh Deer :/ Saabaru down... new car ideas? So far I’ve hit 2 deer in my 11 years of driving (and thankfully none on my motorcycle). 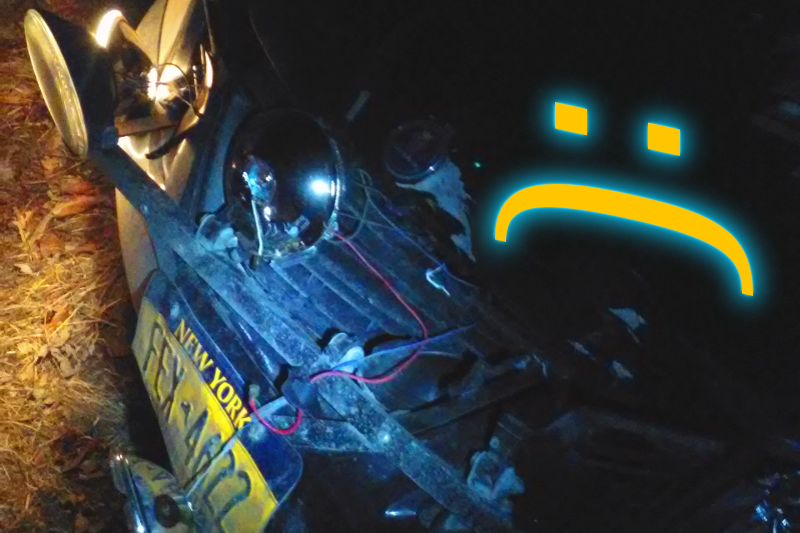 My homemade light bar got destroyed and my Hella lights vaporized instantly, but worse was the fact that it shoved my radiator core back about a foot leading to coolant and steam everywhere... It was definitely tow truck time. The only thing left to do is wait and see what the insurance company says... and of course browse craigslist. Nothing that happened is unfixable, but given that I was at 166k miles and Saabaru body panels can’t be as readily available as their Subaru counterparts it might be time for the car to head to the great gravel stage in the sky. Thankfully if that does happen the auto yard where it was towed is only a few miles from my parent’s house. I’ll need to go reclaim my Sparco Terras/snow tires and Rally Armor mud flaps - everything I used to put my car in Winter Mode©. On the other hand, maybe they will fix it... but that’s not as interesting to think about. I’m in the Saratoga/Albany NY area - anybody have suggestions for a cheap daily that won’t make the 2 hours of driving a day I do miserable? El Manuel required, and it must look good with a light bar so I can play rally pilot again. Given the Sparco wheels I have currently I’m leaning towards another Subaru/Saabaru. Should I test the theory that there is no such thing as a cheap WRX? All opinions considered.